Last year I said I would never read a medical romance again. The difference this time is that the book I have been reading is by a author who I have read before and I trust her work. 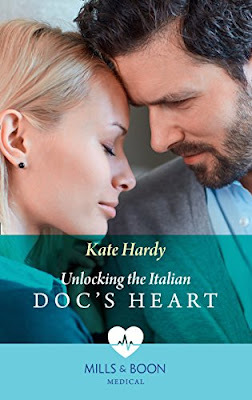 For me this book was brilliant, mainly when it came to the medical symptoms, Ms Hardy wrote it a way that I could understand, and when she described Verona if I could I would be on the next plane, Verona sounds marvellous especially the history. Jenna and Renzo are the type of doctors you know you can trust, if your child had to go to hospital. Both Jenna and Renzo come from loving families, Jenna has a twin sister and when her sister had a accident Jenna did something for her sister, that was so selfless. Renzo is coming to terms with a broken heart, which does affect his relationship with Jenna. I also liked when Jenna was taking her neighbour's dog Charlie for a walk, and she airing all her troubles and she said, it was like Charlie could understand. If you have a pet then you will relate to this, because we all talk to our pets as if they understand what we are talking about. I will give this 5/5 stars, the book is on pre order at Amazon UK and is released on 31st May.